Everyone who's ever listened to Thriller (and that's pretty mucheveryone on the planet) knows of "The Girl is Mine," the catchy, cheeseball collaboration between Michael Jackson and Paul McCartney. At any rate, though it's one of the weakest tracks on the album, it deserves some credit for using a chorus with the word "doggone" in it (that takes balls). The song was bafflingly released as Thriller's first single, and was soon overshadowed and overcome by every single other track on the album. 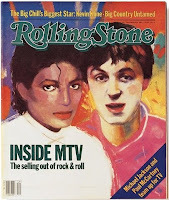 But few know of the extent of the relationship that formed between Macca and MJ during the early 80's. It began with the song "Girlfriend," which McCartney wrote specifically with MJ in mind. McCartney recorded it in 1978, and MJ followed suit with his far superior version, which was included on Off The Wall in 1979. “He called me up on Christmas Day one year and asked, 'Do you want to make some hits?' So I said yeah, sure, you know, being of the hit-making variety. So we did, and it was really nice. He came to my house, and he got to know the family and stuff." After they recorded "The Girl is Mine," MJ returned the favor to Macca by singing on a lost McCartney classic "Say, Say, Say." This song is better than "The Girl is Mine" in almost every way, but somehow few know much about it. Now that's a satisfying romp of a music video! This lovely friendship between two of the biggest pop stars in the world was not to last, however, as MJ stabbed his buddy in the back in 1985 when he outbid McCartney himself to own the rights to the entire Beatles catalog for $47.5 million. Though many thought this action unforgivable and sacrilegious (he gave the legacy of John Lennon a big "F U" by selling "Revolution" to Nike), it turned out to be the best business decision that MJ ever made, reaping him enough money to buy millions of pet monkeys. Regrettably, Macca and MJ never spoke again. The End! You learn something new every day. Thanks E.